Here's an easy way to approximate what $10,000, or $100,000, or any other amount will be worth in 10 years. It works for bonds, CDs -- any investment that you expect to compound at a constant annual rate. You can even use it to ballpark the results for 20, 30, 40 or 50 years. (Note: to estimate returns for 5 years, and multiples of 5 years, see What Will my Bond or CD be Worth in 5 Years?.) In all cases, you supply the interest rate, and read the multiplier off the chart. NEW! Try my new interactive bond interest calculator. It does the same calculations as the graph below, but for any number of years, and for any interest rate. Then come back to this post; graphs are still better for seeing the big picture. For the future value a dollar, see What Will $100 be Worth in 10 - 20 Years? 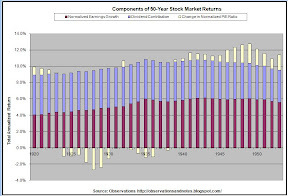 Finally, because stock market results are not consistent, for stock market results see What Will a $10,000 Stock Market Investment be Worth in 10 Years? instead. The interactive bond calculator will give you more accurate results. However, since the calculator may not work for all browsers, I'm providing this graph as a way to approximate the results. What Will a $10,000 Bond/CD be Worth in 10 Years? Note: the multipliers (on the vertical axis) range from 1 to 10. The bottom (labelled) line corresponds to a multiplier of 1, the next (unlabelled) line to a multiplier of 2, etc. The lines are not the same distance apart because the vertical axis uses a log rather than linear scale (see about log graphs). What Will a $10,000 Bond/CD be Worth in 10 Years at 10%? In the graph above (click to expand), find 10% on the horizontal axis. The multiplier looks to be about 2 2/3 (it's actually 2.6). So, $10,000 at 10% for 10 years is approximately ($10,000 x 2.6=) $26,000. The multiplier is the same regardless of how much money is invested. This same multiplier works for $1,000, $100,000, or $364.27. What Will $100,000 Grow to in 10 Years at 6%? Find 6% on the horizontal axis. The multiplier looks to be about 1.8 (and it is). 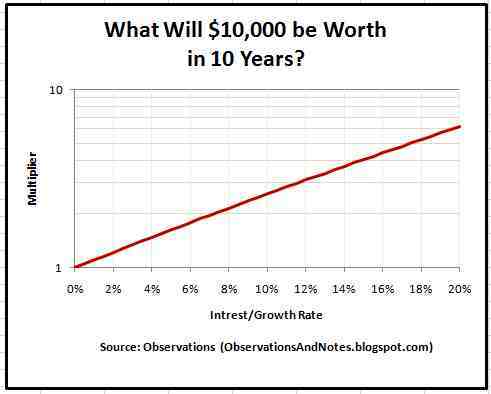 So, $100,000 at 6% for 10 years is approximately ($100,000 x 1.8=) $180,000. With a little additional math, you can approximate the results for 20, 30 or more years. What Will a $10,000 Bond be Worth in TWENTY Years at x%? Note that we can also approximate the results for 20 years. For example, from above we know that the 10% multiple is about 2.6. Therefore, at the end of 10 years, $10,000 will grow to approximately ($10,000 x 2.6=) $26,000. And, $26,000 invested at 10% for the second 10 years would be about ($26,000 x 2.6=) $67,600. Alternatively, you could have calculated the 20-year multiple directly as 2.6 x 2.6 = 6.76, and multiplied 6.76 times $10,000. (Reminder: these are approximations; the actual number is $67,275). What Will a $10,000 Investment be Worth in 30, 40, 50 Years at x%? You can repeat this process as many times as you like to get ballpark results for 30, 40, 50 years, or more. For example, you would approximate the 30-year 10% multiple as 2.6 x 2.6 x 2.6 = 17.576 (the actual multiple is 17.4494). Alert! The remaining sections are more complicated. How Long Will it Take to Double/Triple my Money? For your investment to double in 10 years, you need a multiplier of two. Find the "two" multiplier line on the vertical axis and see where it intersects with the red line; it's about midway between 6% and 8%. So, doubling your money in 10 years requires an interest rate of about 7% per year (note: I'm assuming interest is reinvested each year, and no taxes). Tripling your money (multiplier equals 3) requires an interest rate of something less than 12% (actually it's 11.5). What Rate do I Have to Earn to Grow $10,000 to $25,000 in 10 Years? $25,000 is 2.5 times $10,000. So, you want to know what interest rate will give you a multiplier of 2.5. Find 2.5 on the vertical axis and you'll see that it intersects the graph line at between 9 and 10% (it's actually 9.5%). 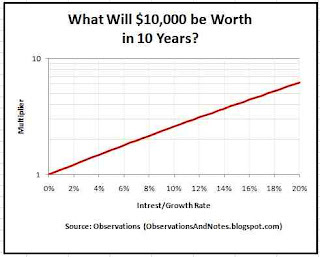 Estimating the Future Impact of Inflation: What Will $10,000 be Worth in 10 Years? Note: For an easier and more powerful way to estimate the impact of inflation on the value/purchasing power of the dollar for from 1-50 years, see What Will $100 be Worth in 10-20 Years. The impact of compounding is the same whether it is benefiting you or working to your detriment. As a result, you can actually use this same graph to estimate the future impact of inflation on your retirement dollars (though it's much simpler to follow the link above). For example, let's estimate what $10,000 will be worth in 10 years if there is 3% inflation. Find 3% on the horizontal axis, see where it intersects the graph line, and I'd guess the multiple is somewhere between 1 1/4 and 1 1/3 (the calculator/spreadsheet says it's actually at 1.3). But now you want to divide by the multiple. So, if inflation averages 3% for the next 10 years, $10,000 in today's dollars will have the purchasing power of about ($10,000 / 1.3 =) $7690 10 years from now (the actual number is $7441). How Much Will Your Bond/CD be Worth in N Years? (calculator): Will give you more accurate results, and works for any number of years. What Will My CD or Bond be Worth in 5 Years? : graph similar to this post, but for 5 years, and multiples of 5 years (5/10/15 ... years). How often have past stock market 10-year returns been 3%? 6%% 20%?? -- the frequency distribution of historical 10-year stock market returns. The Declining Value of the U.S. Dollar graphs the decline in value since 1900. Wouldn't a bond or CD generating 10% interest return $20,000 (original $10,000 and another $10,000 of interest over the 10 years) over 10 years, not the $26,000 indicated above? Nope. This is compound interest, not simple interest. I'm compounding annually. So, at end of year 1 you have $11,000. However, at end of year 2 you have $12,100 -- not $12,000 -- because you earn 10% on the $11,000 you have at beginning of year 2.